There are few times in my life that I can recall having felt I had arrived in paradise. Last year, during a trip to Costa Rica, I fell head over heels for the rocky cliffed beach and village at Montezuma and that was as close to the characteristic ‘paradise’ as I felt I had been before, despite extensive travels. It is a heartily difficult thing to achieve and the term means something different to everyone, so it’s understandable that it had not appeared so frequently in the past. So when the boy and I pulled up at 2am to our hotel in Varakala, Kerala in our pre-arranged taxi having traveled for 20 hours from the tip-top of India’s northeast to nearly its very southern point, I wasn’t in a mind-frame that was expecting paradise. I was just bloody tired. The grounds at SeaShore Beach Resort. After a solid sleep, we emerged from our room to inspect the place we were staying at – the SeaShore Beach Resort. Having arrived in the pitch black, it was still a mystery to us. And there, in the searing neon yellow sunlight, we found paradise. Or, at least, what I consider to be paradise. 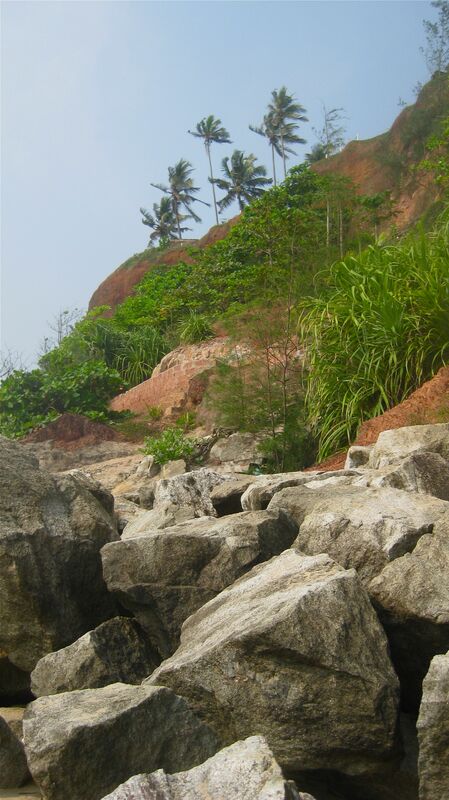 The view from the cliff edge at SeaShore. 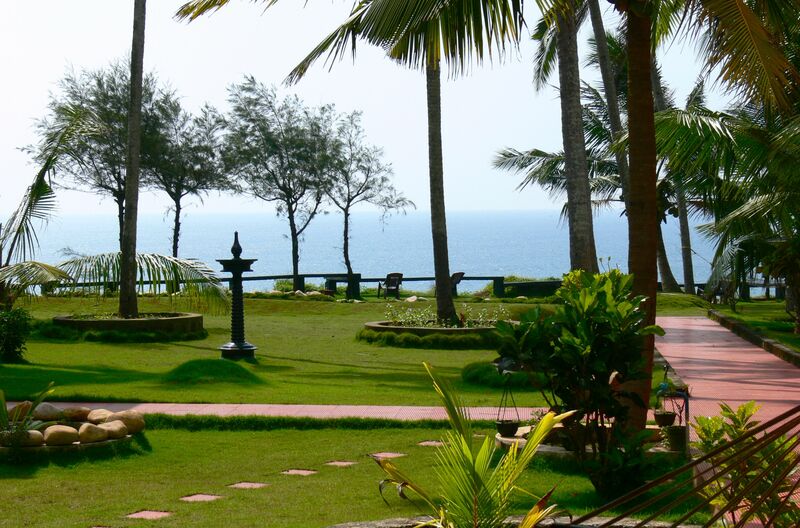 With an expansive lawn dotted with palm trees and pathways, the hotel’s modest grounds led straight out along what is known in Varkala as South Cliff, to the cliff’s edge where, a hundred feet below, golden sand stretched for miles. Having come from the chilly northeast, the heat quickly warmed our souls while the view mesmerised us. 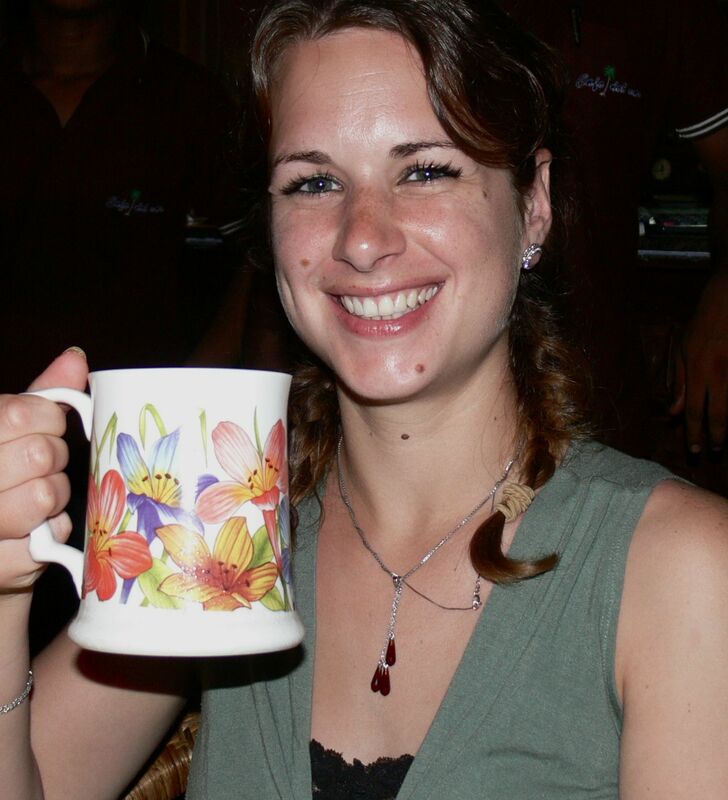 Our stay at SeaShore was only one of the many highlights of our four-day adventure in Varkala but it was a big one. The fact the manager’s name is Shine and the fact he spends his every moment smiling, was an additional bonus. 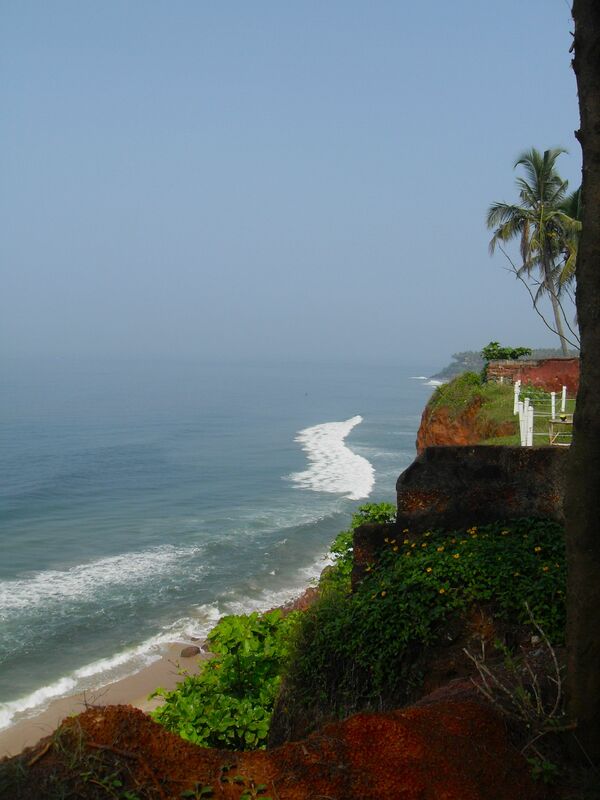 As background, Varkala sits on the south western side of Kerala, which is India’s most southwestern state and which has the nickname of ‘God’s Own Country’. It used to be a quiet hideaway but in recent years has been gathering more and more publicity so that it now has a whole stretch along the sea front filled with buzzing cafes, restaurants, bars and shops. It has two ‘cliffs’ – the North and South Cliff, with the latter catering more to those wanting to be right in the midst of the action and the former for those wanting to stay in places that are a bit quieter. Given the South Cliff was only a 15 minute walk (max) to the main touristy area, the boy and I were more than happy to reside in a more relaxed neighbourhood. The town is known for its red sandstone cliffs, that make it stand out dramatically when one is on the golden beach below and also make it a more ‘active’ place to stay given one has to climb up the rickety stairs carved into the cliff-side. We liked Varkala mostly because it managed to balance itself between being tourist-friendly without being super ‘touristy’. 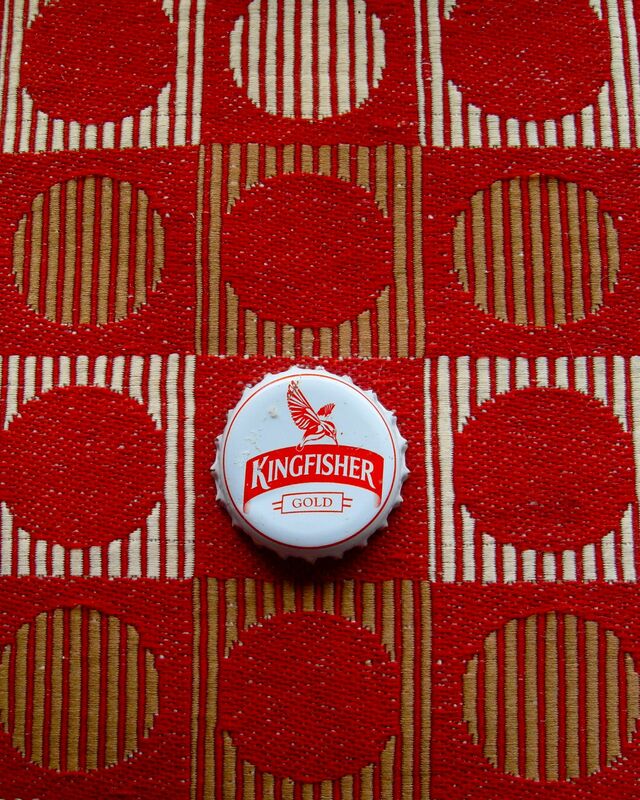 For the first time during our time in India, there were restaurants that specifically stated on their menus the use of bottled water for making ice cubes (which meant I could enjoy a cold drink without fear of Delhi relapse) and there was a buzzy, vibrant travellers’ atmosphere that made it friendly. Okay, I admit, it may sound like a bit of a cop-out to say we fell in love with a town that obviously catered to tourists when we were meant to be seeing ‘proper’ India. But, after two weeks of dusty, dirty, chaotic places where everyone stares, it was nice to just relax into things, to wander about (fairly) freely and to take things in. Sometimes, when traveling, one needs a bit of a balance. Beer in a mug – that’s what I like! We spent our days meandering between South and North Cliff, swimming at the more private beach (to which the hotel has direct, private access to) and eating to our hearts’ content at various restaurants. Our favourite was the meal we had at Clafouti, which is at the far end of North Cliff. As there are dozens of places to dine on the sea front, we would simply walk up and down until we saw a place we liked. The host managed to lure the boy and I in one night with the promise of a large fresh fish (which we picked out from the table displaying dozens on ice), plus coconut rice and vegetables for 550r (or, £6.40). With a few beers each, our meal was maybe £9, the fish soft and flavoursome having been steamed in the tandoor and the atmosphere was amazing. We stayed until at least 1am, finally wandering back to South Cliff in a happy haze. Another night, we stopped by the Rock ‘n Roll Cafe, a bit further down from Clafouti. It had a BOGO happy hour special and a surprising (but comforting) western style set-up with big comfy couches, great music and a perfect view of the sea. Around 30 minutes into our drinks, the whole sky suddenly became viciously dark as rebellious black clouds streamed in. And then the rain hit. For 25 minutes, the boy and I witnessed the most intense lightning and rain storm I have ever seen. The power went out at the cafe but, somehow, the music kept playing. As Amos Lee’s ‘Night Train’ flowed through the speakers and as we drank our icy cocktails, I couldn’t help but think: even in the most insane storm, Varkala is still paradise. 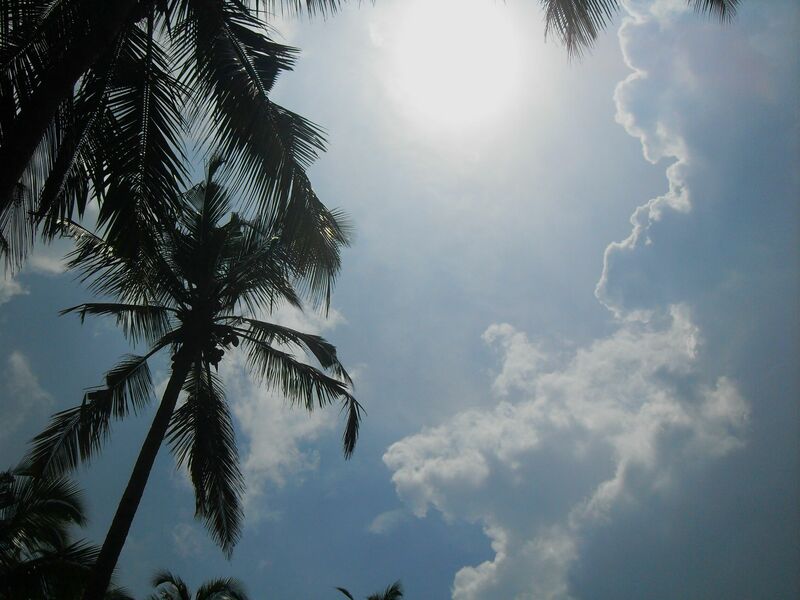 In Part 7, the boy and I take a rebel bus north up the coast of Kerala, find frustration in Alleppey and finally, get scammed.